Our love/hate relationship with hair is dependent on whether it is still attached. Last week, I had my hair cut. While I was in the chair, I overheard the two trainees squabbling over whose turn it was to sweep the floor. It seems they felt that this job was beneath them. These women are so fond of hair that they have devoted their careers to handling it, and yet when hair is lying on the floor, detached from the head, it becomes so repulsive that they avoid it at all costs. Hair is “both revered and reviled”. In some contexts we adore it. It is fondled, envied and worshiped. In others, it provokes a feeling of revulsion. “We find it a source of shame or a case of filth… discarding it with disgust as it collects in the bottom of our sinks or bathroom drains”. 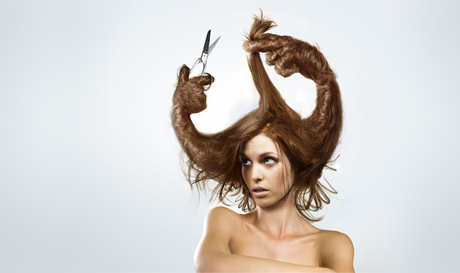 As soon as hair is removed from the body, it is classified alongside other bodily waste. It is classified alongside blood, urine or nail clippings, and is considered similarly unhygienic. This perception that hair can be unhygienic extends to hair that is still attached to our bodies. Whenever it is unkempt, or sprouting from the wrong body part, it can make us feel uneasy. A hairy body seems to imply regression to a savage, animalistic state – like the Wild Man who lives in the forest . In contrast, shaved or tamed hair implies intellectual advancement and civilization. If hair trimming are considered human waste, comparable to nail clippings, it is curious that they recover their desirability when woven into wigs. Wigs and extensions made of human hair are significantly more expensive than synthetic alternatives. In some cases, a full head of someone else’s hair can be more desirable than your own. So it seems that recovered hair is cleansed of the distasteful connotations. Once it has been filtered through the creative process of wig-making, detached hair seems to regain its status as a thing of beauty. If it is reclassified, hair is a valuable commodity. Scarcity of hair donors (particularly natural blondes) keeps the price elevated. Hair buyers flock to the poorer regions of Russia and the Ukraine to pay cash-in-hand to women who are willing to shave their heads. In the West too, women have been known to sell their hair to wigmakers in times of economic hardship. With a recent boom in the popularity of extensions, thieves have been incentivized to steal hair from salons. In all of these cases, the value of hair is directly affected by context. Every object “passes through different cultural contexts which may modify or even transform what it means”. As with many other objects, recontextualisation of hair can diminish or increase its value, and alter our perceptions. Just as Duchamp was able elevate a urinal to the status of art by placing it in a gallery, waste hair that is gathered up from the hairdresser’s floor can be reclassified as a beauty product. Doan, Sean-Patrick, ‘After Shave: the Historical, Cultural, and Social Implications of the Shaved Body,’ (2011), 2. Park, Gloria Toyun, ‘Shave,’ Frontiers, Vol. 17, No. 2 (1996), 101. Dickason, cited in Doan, 6. Kramer, Andrew, ‘For Russia’s Poor, Blond Hair Is Snippet of Gold,’ The New York Times [online], (November 21, 2010). Williams, Timothy, ’Costly Hairstyle Is a Beauty Trend That Draws Thieves’ Notice,’ The New York Times [online], May 16, 2011. Khan, Eve, ‘Historical Hair Locks Selling at Auctions,’ The New York Times [online], (December 13 2012). Rose, Gillian, Visual Methodologies, 2nd ed., (London: Sage, 2007), 223.